Looking squarely at the camera, those two words poured out of Tiger Woods’ mouth over and over again. Woods held a news conference today where he delivered a 16 minute scripted apology. The golfer admitted that he felt that the rules of marriage didn’t apply to him. He said that because he had worked hard his whole life, he was “entitled” to his temptations. 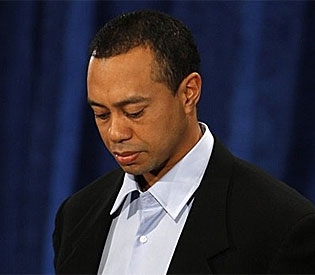 Woods confessed that he was “deeply sorry” and he had “a lot to atone for”. Yet the cause for his accident that spurred this whole ordeal remains a mystery. Woods says that he and his wife have begun speaking about the future of their marriage, but the details of that will stay between husband and wife. Woods let us have a glimpse of his childhood when he explains that he grew up as a Buddhist. He recited that “Buddhism teaches that a craving for things outside ourselves causes an unhappy and pointless search for security, and it teaches me to stop following every impulse and learn restraint.” He said that he forgot what he was taught and that he will be looking to Buddhism for guidance. Among his apologies, he highlighted the fact that he does have a good side. 13 years ago Tiger Woods and his father started an organization that is dedicated to “helping young people achieve their dreams through education.” He says that despite all that has happened, his dedication will not waver. This press conference did not accept questions at the end, but he did address what all the sports fans of the world really want to know. Although he was vague about an exact date, he didn’t rule out a come-back this year.